Showing results for tags 'Steve Vai'. 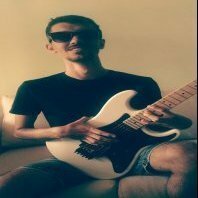 Реших да публикувам тема за хронологията на сътрудничеството между Steve Vai и Ibanez. Интересно четиво за почитателите на Ibanez RG/JEM/UNIVERSE p.s. 1 - Може да допълвате, ако имате още информация или нещо е пропуснато. p.s. 2 - Извинявам се предварително, че е на английски. (all dates approximate) 1986 - Green Meanie prototyped by several guitar vendors in attempt to lure Vai to endorse their brand guitar. 1986 - Ibanez wins and creates the JEM777 series in 1987 based on this guitar. Ibanez retools it's lineup and introduces a recessed-tremolo in to all new models, including it's baby-brother RG series. Dimarzio assists in creating the JEM pickups, later to be sold as PAF PROs. 1987 - Vai has an idea to takes curtains from parent's house and ibanez fabricates a JEM guitar covered in this fabric. Ibanez retools their "tree of life" inlay and makes glowing green inlays for the new model. These guitars are heavily played, photographed and toured with. The JEM77FP is introduced into the market in 1988. 1988/1989 - Vai wants Ibanez to create a 7-string instrument from the JEM and takes several 7-string prototypes on tour with Whitesnake soon thereafter. Vai records/writes parts of PAW with the 7-string jem. 1988/1989 - Vai wants a "multicolor" guitar like a tye-dye fender bowling ball axe. Gets ATD involved and Ibanez signs on. ATD would soon swirl several hundred UV77MCs for Ibanez. 1990 - the Universe 7-string is released by Ibanez into full production. Four models available, including the multicolor. A 7-string tremolo is fabricated for full production. 1992 - Vai designing the next generation JEM for his non-instrumental "Vai-band". It will include new pickups, the AANJ and have alder body. DiMarzio designs another pickup(s) the neck/bridge matched Evolutions. 1995 - Ibanez creates "Bad Horsie" JEM for Vai, which is essentially an unfinished ash-bodied VWH. It is detuned and used for the song and Fire Garden tour. 1996 - JEM10 designed and sold as an anniversary tribute. High quality with loads of detail. Priced reasonably and many made. Vai's interested in playing this axe live is resigned to being used for G3 soundcheck and it is subsequently raffled off (#16) after the tour (cool giveaway!). 1997 - the Vai designed "the Breed" neck/bridge matched pickups are released to market, which eventually find their way into a "more affordable" JEM7DBK in 1999 and later the DNA. None of which are used live in a significant capacity to date. 1997-ish - Vai is included on the Buzz Feiten endorser list for their tempered tuning nut and intonation system. Ibanez balks at including it in *any* production models. 1997 - Someone wants to capitalize on the Hoshino 90th anniversary and rushes out the JEM90HAM based on the RG-METAL1. Rumored to have been designed for the Japanese-domestic market only, the HAM models find their way worldwide, in a near unlimited production. All orders taken before 3/1/98 are fulfilled. Vai adds a SUSTAINER to a JEM90 and allows his backup band to play it (Keneally & later Dave Weiner) on tour. 1998-ish - Steve Vai listed on the fernandes sustainer "endorser" list & website 1999 - Vai tours with a "sustainer" equipped JEM (flo - heavily modified JEM77FP) which is played extensively. It is even used for the climactic FTLOG, replacing EVO for most of the set. Vai opens the set with a chrome-ish Fender Strat with LED fretboard inlays. 2000 - DNA model released with Vai's blood used partially for another ATD swirl. Priced thru the roof and produced in a limited number (unlike previous "collector models"), which quickly sells out. 2000-2002 - Vai playing his "Sustainer equippped" JEMs near exclusively on tour, including writing/releasing a song exclusively for it ("Whispering A Prayer"). 2001 - Vai is said to have disallowed the planned "purple jem" 555 replacement model by Ibanez, which was slated to be be japanese made with edge/lopro trem, at a good entry price (below DBK). 1/2002 - Vai uses FLO for his NARAS "Nothing But Guitars" appearance in NYC and talks up how useful the sustainer is and what it can add to his music (despite it having dead batteries - LOL). 2002 - Vai plays a piezo equipped JEM ("pia") at the Grammys. 2002 - Ibanez with Vai's approval releases a JEM333 (further cheapened 555) for markets where the JEMs are typically sold at full list price and where bootlegging is rampant. Vai granted approval after 3 prototypes were made for him to inspect. Note this guitar is not intended for sale in 95+% of markets. Much more JEM333 discussion here along w/ Steve's full clarification. https://soundcloud.com/sonnymvk/whitesnake-now-youre-gone-solo-2 Една от любимите ми песни на една велика банда.